“All rosy and healthy on the outside, but all ashes inside.”- D.H. Lawrence. And here’s the cheesecake. That’s what it should be called, really. ‘The Cheesecake.’ It’s so good you’ll never turn to another. So many of you asked for the recipe, and I obliged. The filling? The softest, smoothest, most dulcet, coffee crème fraîche flavoured interior that’s studded with flecks of vanilla bean. The base? A brown butter number. With toasted hazelnuts and grahams. Bittersweet dark chocolate ganache to adorn. A slight hint of flaked salt. That part’s always mandatory. I’m a firm believe that salt makes everything better (it does). Coffee Crème Fraîche Cheesecake. It’s the kind of cheesecake you can adapt to your own liking. The shot of coffee can be switched out for another flavouring. The ganache too. I’ve always wanted to try a caramelised white chocolate top. Or even a peanut butter glaze. I’ve done the cheesecake before with poached fruit. The crust? I like it slightly thick, but that’s purely for the sake of textual contrast. If you like your crust waning in existence, use less. Whatever way you want it, however you like it. It’s all delicious. Oh, and, I appreciate all of you for giving me this space to keep creating. Keep writing. Keep making these delicious things we all love. Your balance is never lost on me. Pre-heat the oven to 180 c. Grease then line the base and sides of an 18 cm / 7 inch springform cake pan with non-stick parchment paper. Carefully cover the base and sides of the cake pan in two layers of aluminum foil. Set aside. Make the brown butter. Place the butter in a medium sized saucepan set over medium-low heat. Cook, stirring often, until the butter is golden and melted. The butter will begin to foam but will subside as it continues to cook. Increase the heat to medium. Continue to cook the butter, swirling the pan occasionally but not stirring, until it is beginning to turn amber brown in colour and smell nutty in fragrance. Some burnt butter bits should also have formed at the bottom of the saucepan. Remove from the heat and set aside to cool until needed. Place the graham cracker crumbs, hazelnuts, sugar and salt into a medium sized mixing bowl. Add the browned butter and stir with a wooden spoon until evenly moistened and combined. Tip the mixture into the base of the prepared cake pan and gently press it to form an even layer. Bake the crust, for 8 to 10 minutes, until it is just beginning to turn golden brown and is firm. Remove from the oven and set aside to cool whilst you prepare the filling. Immediately lower the oven temperature to 120 c.
In the bowl of a stand mixer fitted with the beater attachment, or using handheld electric beaters, beat the cream cheese until it is very smooth, 3 to 4 minutes. Pause mixing and scrape down the bottom and sides of the bowl. Add the sugar to the cream cheese and beat on medium speed until incorporated and fluffy, 3 more minutes. Add in the eggs and egg yolk, one at a time, making sure to beat well after each addition. Beat in the vanilla bean paste, coffee, liqueur (if using) and salt. Add in the crème fraiche and continue to beat until the batter is very smooth, light and well combined, 4 more minutes. Pour the filling over the cooled crust and use an offset spatula or the back of a spoon to smooth out the top. Fill a deep-dish roasting pan ¾’s of the way full to the top with water. Place it in the bottom, or the lowest shelf, of the oven. This will create a moist environment for the cheesecake to bake slowly and will prevent any cracks from forming in the top. Bake the cheesecake, for 2 ½ - 2 ¾ hours, depending on the heat strength of your oven. The cheesecake should bake slowly. Let it. A slow bake is the best way to control stability. 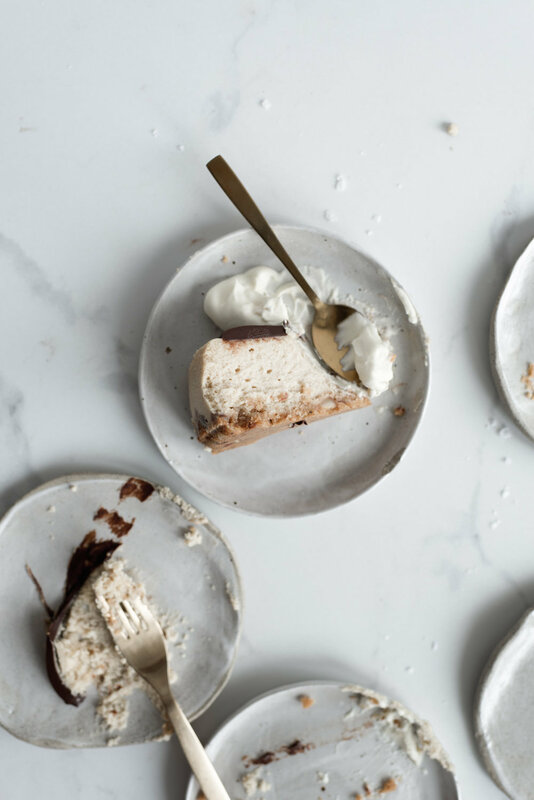 The result is the most soft and light cheesecake imaginable. And one that isn’t susceptible to cracks, collapsing middles and burns. When the cheesecake is ready, it should be firm around the edges and top, but with a slight jiggle remaining in the center. Turn off the heat and pry the oven door ajar slightly. Let the cheesecake cool to room temperature in the open oven, about 1 hour. Do not unmold the cheesecake from its pan. When it’s at room temperature, place the cheesecake in the refrigerator to chill for at least 8 hours, but preferably, overnight. When the cheesecake is completely cold and you’re ready to serve, undo the rim from the springform cake pan then remove the parchment paper from the edges. Carefully remove the cheesecake from the cake pan base and the remaining layer of parchment paper from the bottom. The cheesecake should be firm enough to handle, but, gently, set the cake out and onto a serving plate. Top with a layer of the dark chocolate ganache. Place the finely chopped dark chocolate into a small mixing bowl. Heat the cream in a medium sized saucepan set over medium-high heat, until it is about to reach a large rolling boil. Remove from the heat and pour the hot cream all over the dark chocolate. Let the mixture sit for 1 minute to acclimatize, then stir with a rubber spatula until completely smooth. Leave to cool and thicken slightly, about 10 minutes. Pour the ganache all over the top of the chilled cheesecake and use an offset spatula, or the back of a spoon, to smooth out the top. Set the cake in the refrigerator for 30 minutes to slightly harden the ganache. Sprinkle with flaked salt and serve.